Did you guess what they were? Well I’m sure some of you solved the May mysteries! Yes, both these domestic items belong in the laundry of yesteryear. 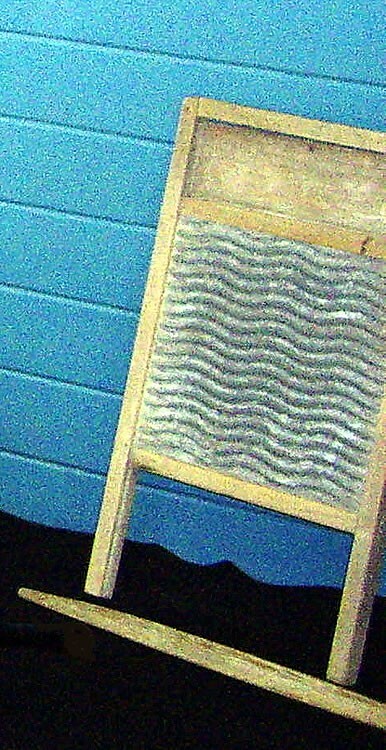 The rectangular washboard or scrubbing board was an aid to hand washing and a vast improvement on bashing or scrubbing soiled clothes on river rocks to remove the dirt. The wooden frame of the washboard held a working grooved section of metal, galvanized steel, zinc or even glass. With the displacement of washboards by more modern appliances some of these useful items found themselves new homes as they were converted into percussion instruments! Laundry Day was often a Monday and demanded a very labour intensive routine in contrast to the press button ease of washing activities in many areas today.